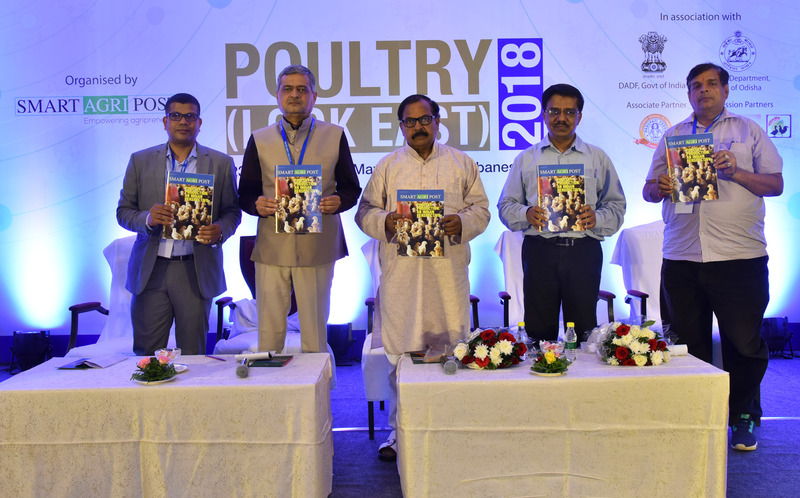 Bhubaneswar: Poultry Look East 2018, a National Conference on Poultry, was conducted by a leading national level agricultural monthly magazine SmartAgripost at Hotel Mayfair, Bhubaneswar on October 23, 2018, wherein delegates from all over the country participated. The inaugural session was attended by Rabi Narayan Das, Advisor Planning Board, Government of Odisha, Dr P K Shukla, Registrar, DUVASU, Mathura, Ratnakar Rout, Director, Animal Husbandry & Veterinary Services, Government of Odisha and Dr Hara Mohan Dash, President Odisha Poultry Association. Welcoming the dignitaries and delegates to the conference Pravash Pradhan, Editor of SmartAgripost hoped that the conference would provide an excellent platform to all the stakeholders to discuss various challenges faced by the poultry sector. Director A&H highlighted how the SHGs are being roped in for poultry farming in Odisha and Dr H M Dash spoke about the problems faced by poultry farmers in Odisha. While Dr P K Shukla depicted the status and challenges facing the poultry sector, R N Das spoke about the intent of the the Government of Odisha to tread the poultry route for achieving the goal of doubling farmers income. After the inaugural session three important business sessions were held in which the Government officials, academicians and experts from the poultry sectors deliberated at length on various issues. The first session entitled ‘Issues and challenges of poultry industry’ was chaired by Dr. A.G.Rao and Dr P K Mishra, Dr N C Beura and Dr Rudra Narayan Pradhan spoke on the occasion. The second session dealt with ‘Emerging poultry feed and health management’ was chaired by Dr P K Shukla. Dr R k Mohanta, Dr S K Mishra and Mr M Shanmugam participated in the deliberation. The topic of the third session was ‘Scope of export and processing poultry product. Apart from highlighting government support for various poultry related schemes of Government of Odisha S S Dey, MD, APICOL chaired the session. Dr Vidya Sagar Punja and Mr K S Venkatachalapathy focused on the possibilities in processing of poultry products, especially egg processing, and underlined their export potential. Issues like challenges of backyard poultry, disease control, feed, protest by animal right activists on banning cage rearing, processing, export etc. were covered in these sessions. There was a lively question and answer session after the technical sessions in which the delegates raised various issues and the experts answered the queries convincingly. The Chief Guest Sashibhushan Behera, Minister, Fianance and Excise, Government of Odisha, who attended the valedictory session felicitated seven achievers for their contributions to poultry sector. The October issue of SmartAgripost, which had poultry as its theme, was inaugurated on the occasion. Dr P K Shukla presented the issues raised by the participants in the previous three sessions in a nutshell. Dr Hara Mohan Dash, President, Odisha Poultry Association raised the issues of input subsidy, making available land at subsidized rate to the poultry farmers, GST anomaly etc. J N Sarangi, Addl. Secretary, Fisheries & ARD, Government emphasized that the industry demand for setting up of a Poultry management institute may be favourably considered by the Government. ‘Presently there is no inhibition in poultry farming and it has gained both acceptance and recognition especially among educated youth’ was opined by the Finance Minister. According to him, poultry will play a major role in achieving the goal of doubling farmers income, especially in a tribal dominated state like Odisha. The meeting ended with a vote of thanks offered by the Editor, SmartAgripost.